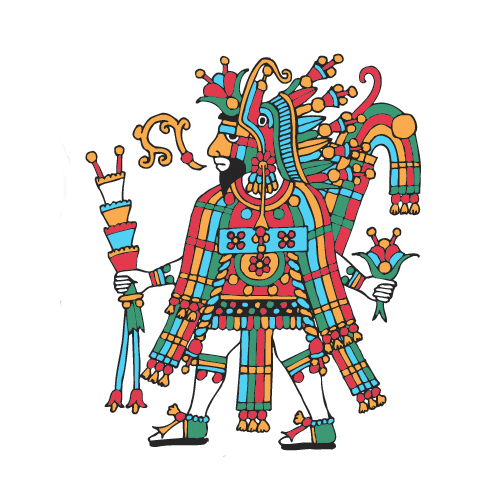 THE AZTEC ICONS are a collection of black and white images of selected Aztec deities designed for coloring (by the serious colorist, young or old). Each is accompanied by a page with caption and model images from the Aztec Codices which may also serve as an authentic coloring-guide. Currently, there are 16 icons, which took almost five years to complete, and I hope to live long enough to create another 10, if not more. THE AZTEC ICONS are presented as standard jpeg files (8” X 10”), each accompanied by a page with detailed caption and illustrations of their sources/models from the codices. Click here to view or download all of the current collection of THE AZTEC ICONS. You can also go to the list below to view or download the individual icons as captioned images or as uncaptioned, freely sizable vector drawings. The Aztec pantheon is probably larger, more diverse, and flat-out scarier than that of any other culture in the world. Indeed, the Hindus have a few dozen deities, including fairly weird ones, and the Egyptians kept a veritable divine zoo, but the Aztecs worshipped hundreds of divinities, many right up there with your worst nightmares. In that pinnacle civilization of the pre-Columbian Americas, the uniquely human propensity to personify (whether singly or multiply) the natural, the divine, the ineluctable, and/or the supernatural, ran hog wild. For the Aztecs, almost every aspect of the world, nature, and human life had a deity in charge of it for good or ill, and usually for both. They saw the dichotomy of what we call good and evil as more of a balancing act not of opposites, but of complementary parts in the whole, like yin and yang. That balance had to be maintained by propitiating the deities with sacrifices, human or otherwise, and some gruesome penitential practices I’d rather not mention here. The Aztec deities are a fascinating crowd of inter-related personalities involved in a soap-opera mythology of creation/destruction, love/strife, and life/death that makes the gods of Olympus look like wimps. Perhaps the confusing dramas, frequent aliases, and surreal images are due to the fact that the Aztecs and their deities indulged in psychoactive drugs like alcoholic pulque, peyote, hallucinogenic mushrooms, and other psychedelic herbs. Click here for YE GODS! THE AZTEC PANTHEON, an illustrated encyclopedia of Aztec deities. For viewing or free download of individual icons, click on links. Images on pages are sized at 8” x 10” (with a page of captions and model images from the Aztec Codices) for letter-size paper at 300 dpi. You can also download the images as vector drawings in two sizes, either of which can be enlarged or shrunk with consistent line quality.